The good life starts out as a biter. It's never that the way we think of a good life from the very start. There are matters to be ironed out before anything can start to get too comfortable. It's likely that there will be a number of games of cat and mouse, of cops and robbers, and of beg, borrow or steal, before the compulsion of the good life changes from nipping at your skinning, pecking at your eyes and assaulting with body blows to letting one see beautiful coastlines and sip the good champagne. Or just a better micro-brew, whatever the options might be. It's just about moving away from the swill and the drivel, the scars and the sadness. 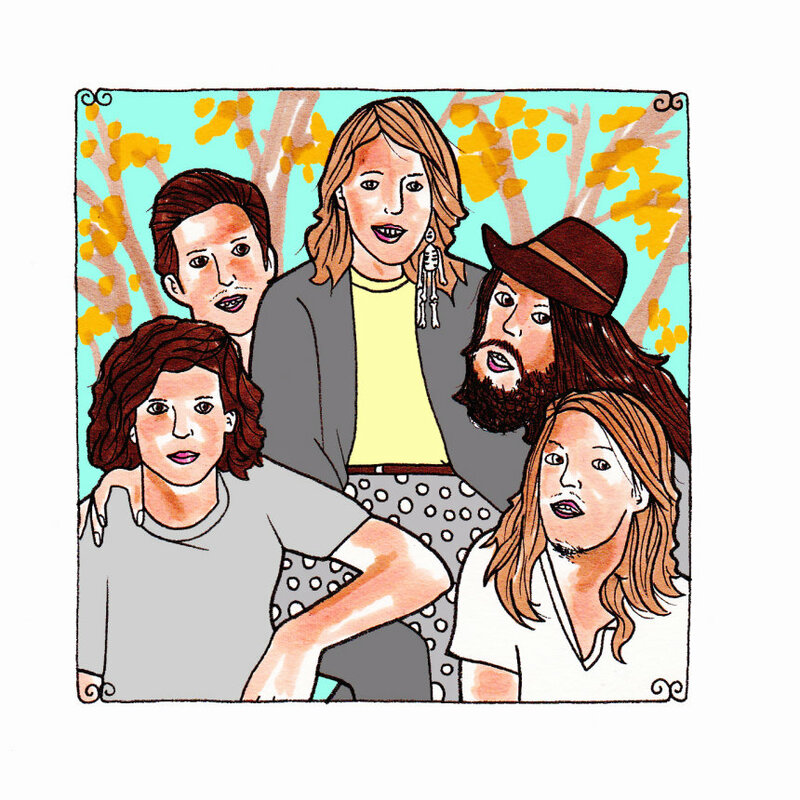 Los Angeles band Grouplove seems to understand that the good life is not one that comes to everyone and, in fact, it's one that eludes most. Many put up with the biting and the kicks in the pants, believing that these are just initiations and that the hazing will run its course and finally, one day, they'll get that house with the three-car garage and a pool out and around the back - or something along those lines. A lot of dreams probably include more, but what they include, according to Grouplove, is all kinds of time for getting down to a cove, to a beach and getting to feel how amazing it is to be there - in a bathing suit - running into the ocean waters in the middle of a work day without having to be anywhere else. You're there with your friends and the people who love and are loved by you and you're saying to hell with everything else. The songs on the band's self-titled EP are ripe with those songs of just getting away, finding that leisure time even when it's not come calling. It's about escaping all of the drudgery that comes with adulthood. It's about only getting caught up in the blue of the sea and those top-down highways that you're motoring down. It's music that relies on the idea that everyone has a built-in ability to appreciate the simple forms of beauty if they just allow themselves to be caught up in the endeavor. "Don't Say Oh Well," sounds like a companion piece to Paul Simon's "America." Christian Zucconi and Hannah Hooper singing, "I kiss my mommy on her sweet cheeks/And I told my dad I'm real glad that we are friends," sounds like the less rebellious answer to Simon's, "Toss me a cigarette, I think there's one in my raincoat/We smoked the last one an hour ago/So I looked at the scenery, she read her magazine/And the moon rose over an open field," where the kids are escaping some untenable situation to look for America and their place in it. Grouplove gets wowed by the moonlight rising over and falling onto an open field. They're struck by the ways that colors play with their emotions and they're amazed by the easy friendship that they can find in the least likely places. It's music that comes from the hearts of optimistic Pixies and let's a summer be never-ending, even when it's halfway over.